Do you have lots of holiday quilting to get done by 24th December? Here’s how to get it done real fast. The idea is to see stitches on the top of the quilt or similar project that look just like HAND QUILTING stitches BUT have actually been done on the sewing machine. NO thimble, NO tiny hand quilting needle, NO pricked fingers, NO hours and hours of tiny hand stitching on a huge quilt. You need a sewing machine that has the hand-look quilt stitch. Most (though not all) of our Elna sewing machines have it as we know you just love having this time-saving option! It is the stitch that has one triple straight stitch followed by a single straight stitch – repeated over & over. A GOOD quality invisible thread. Some folk call it monofilament. I like Sulky, YLI, Invisifil – any of the reputable brands. Avoid the no-name bargain bin options as these will more than likely be cheap quality nylon which will stretch and not give you the results you require. Bobbin thread: select a colour that you wish to see as “hand quilting” on the top of your work. 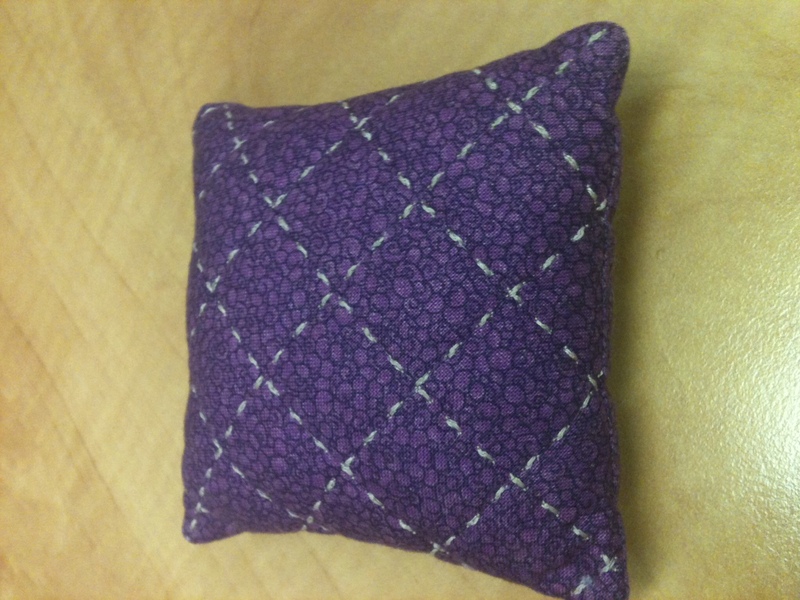 My pincushion had pink bobbin thread. Using a 50wt cotton thread is just fine. You do not have to use fine bobbin thread for this technique. Elna has an optional accessory: the blue dot bobbin case. This comes in 2 types as can be seen in the pics. You will need to choose the one which is recommended for your sewing machine: Notice in the pic where both bobbin cases are shown: the left hand one has a little mechanism in the upper right of the bobbin case. This is the mechanism which is necessary for sewing machines which have a thread cutter built into the machine. However, it ALSO fits some machines which do not have a thread cutter. The other bobbin case on the right in this pic is for all of our other top load bobbin sewing machines. Please see your local Elna dealer for more information. We refer to this optional accessory as the BLUE DOT bobbin case; QUILTER’S bobbin case or LOW TENSION bobbin case – all the same thing: great results for this hand look quilting stitch as well as for FREE MOTION QUILTING. A sewing machine which allows you to adjust speed control and stitch length. 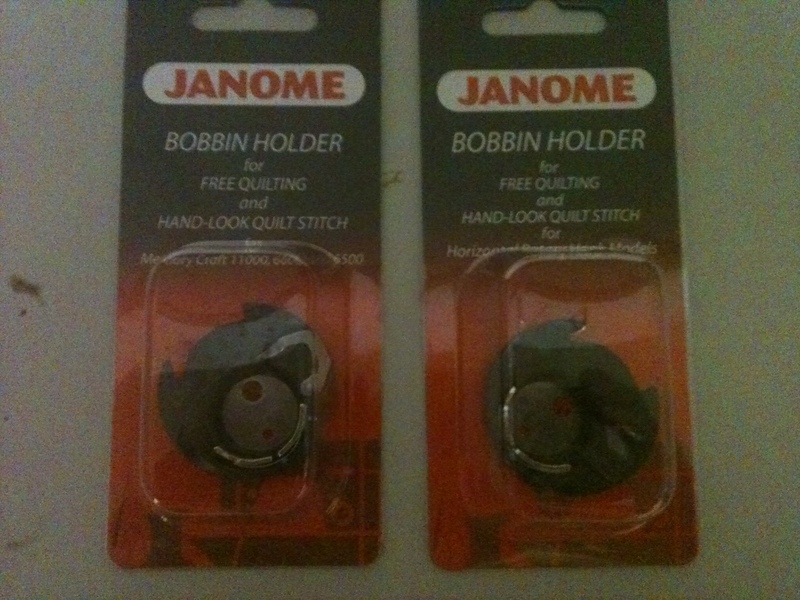 Exchange the regular red dot bobbin case for the correct blue dot bobbin case for your machine. Thread up with invisble thread in the needle and cotton thread in the bobbin. Select the hand look quilt stitch on your machine. Adjust the needle tension by increasing by 1 or 2 numbers: eg if it was 4, make it 5 or 6. Before we had this bobbin case, we had to increase tension as far as it would go to 9 and then often the invisible thread would snap as the tension on it was so high. That was annoying……..no more frustration for us now that we have the blue dot bobbin case as it releases the bobbin thread much easier as it is factory set at a lower tension. Hence we only have to increase needle tension 1 or 2 notches. Adjust stitch length: I usually increase the length of the stitch to 3.5 or 4. I find this gives me a result I like. Adjust the speed at which you sew: if your machine has a speed control knob, reduce to slow. Sewing slowing will give a much better result with this technique as it gives the triple stitch time to form correctly and bring the bobbin thread to the top of the fabric. If you sew too fast, you may not be happy with the results. That’s it: mark your fabric if required and stitcth away……..you will see just how fast your quilting gets done. Let your ELNA sewing machine work for you! This entry was posted in ELNA 7300 SEWING MACHINE, ELNA QUILTING MACHINE, ELNA SEWING ACCESSORY ATTACHMENTS, ELNA SEWING ACCESSORY FEET, ELNA SEWING MACHINE, QUILTING, QUILTING PROJECTS WITH ELNA and tagged BLUE DOT BOBBIN CASE, HAND LOOK QUILT STITCH, HAND LOOK QUILTING WITH ELNA, LOW TENSION BOBBIN CASE, QUILTERS BOBBIN CASE. Bookmark the permalink. Can you show a pic of the particular stitch you are referring to, please? Sorry for the delay in getting to answering this query. It is stitch #95 on the EL740 Excellence. I don’t have an EL740 open in front of me now but page 86 of the manual has a stitch chart which shows #95. 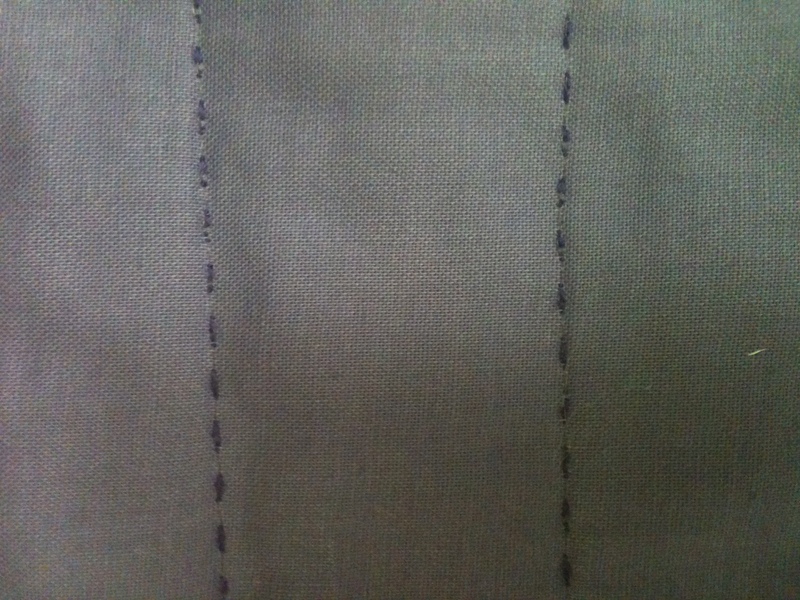 It is a triple straight stitch followed by a single straight stitch. There are instructions for this quilting stitch on page 70 of the manual. 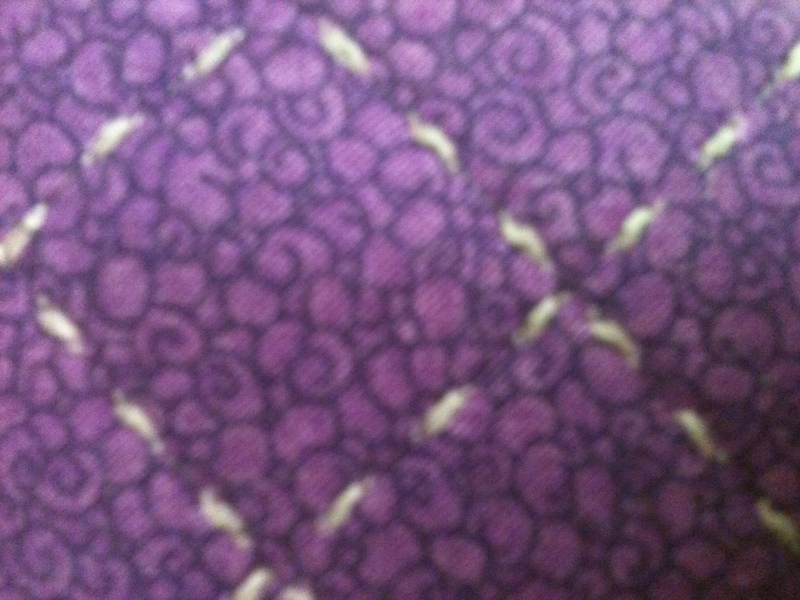 Does the Elna 5000 have this hand quilting stitch? Unfortunately I am unable to answer your query as the Elna 5000 was not manufactured by Janome. But please look at your stitch chart to see if you have a similar triple straight stitch + 1 single stitch pattern or ask your local Elna dealer to assist you.